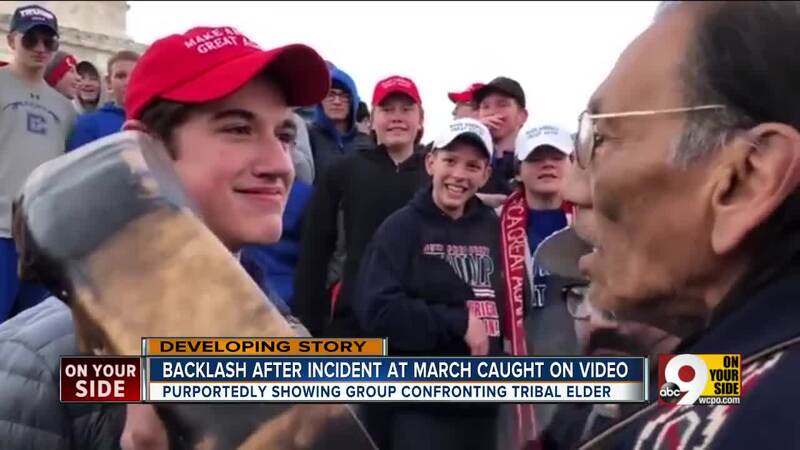 Details continue to emerge in controversial viral CovCath video showing incident in D.C.
Online videos showing Covington Catholic students confronting and mocking a member of the Indigenous People's March in Washington, D.C., have brought widespread condemnation. Tension surrounding a video showing students from Covington Catholic High School interacting with members of the Indigenous People's March in Washington, D.C., on Friday has gained momentum throughout the weekend as details continue to emerge. The videos show one person among a group of CovCath students face to face and smirking at an Indigenous People's Marcher singing and playing a hand drum near the Lincoln Memorial. The marcher was identified as Nathan Phillips, an Omaha Nation elder and veteran. Others surrounding the small group of marchers are shown laughing and taking pictures or videos with their phones. "I was scared, I was worried for my young friends. I don't want to cause harm to anyone," Philips told CNN's Sara Sidner . "I don't like the word 'hate.' I don't like even saying it, but it was hate unbridled. It was like a storm." Some in the group were wearing "Make America Great Again" caps and clothing that connected them to the Tri-State. A few can be seen wearing Covington Catholic spirit wear and some others can be seen wearing Cincinnati Bengals clothing. According to CNN, a woman in the crowd, Kaya Taitano, said the incident started when the teens and four young African-Americans, who'd been preaching about the Bible nearby, started yelling and calling each other names. It got pretty intense, Taitano said, so Phillips started chanting and drumming to try to defuse the situation. "This one kid just refused to move and he just got in Nathan's face," she said. Other boys circled around, she said. "They just surrounded him and they were mocking him and mocking the chant. We really didn't know what was going to happen there." "I did not feel safe in that circle," said Taitano, a student at the University of the District of Columbia who participated in the march and shot videos. In a separate video, Phillips, a former director of the Native Youth Alliance, according to Indian Country Today , said the students were chanting, "Build that wall. Build that wall." Philips called on young people to put their energy to better use, like "helping those who are hungry." "I wish I could see that energy of the young mass of young men to, you know, put that energy into, you know, making this country really, really great by helping those who are hungry," Philips said. "Videos of the confrontation are disturbing, discouraging, and - frankly - appalling. And they are rightfully inspiring a tidal wave of condemnation, even on the City of Covington’s own social sites, leaving the impression that these are the values of the City of Covington. "Yes, the ironic thing - as people keep pointing out to me - is that the school isn’t even located within Covington. But that’s not the point. "The point is that because of the actions of people who live in Northern Kentucky, our region is being challenged again to examine our core identities, values, and beliefs. Regardless of what exact town we live in, we need to ask ourselves whether behavior like this DOES represent who we are and strive to be. Is this what our schools teach? Are these the beliefs that we as parents model and condone? "Is this the way we want the rest of the nation and the world to see us?" Since these events, one Covington Catholic student involved has issued a formal statement, obtained and verified by CNN. WCPO has contacted people who were at the march in an effort to obtain firsthand accounts of what transpired. So far, no one has been willing to speak to us on the record. We will continue these efforts. If you or someone you know would like to talk to a reporter, please email newsdesk@wcpo.com.